If you’re itching for cool nights, warm sweaters, pumpkin spice, and crunchy leaves, you can add another thing to your list to look forward to this fall! 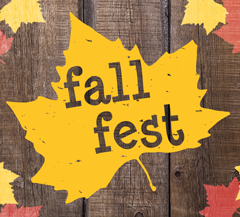 The Rogers Public Library will be having the annual library-wide event, Fall Fest, on Saturday, November 3 from 10:00 am to 4:00 pm. The Children’s library will have autumn themed crafts and carnival-style games from 10 am – 4 pm. From 2 pm to 4 pm, there will be a petting zoo and pony rides on the front lawn. We know from experience that the petting zoo animals are some of the cutest you’ll see that day! There will be lots of local organizations here to talk about the awesome things they do for the Northwest Arkansas community, as well as local authors. We’ll have tabletop games throughout the library for you to play, too! We also have the perfect reason for you to wear your Halloween costume for an extra day. Our annual Cosplay contest will be going on! Come dressed up, and you might win a prize! Contestants can sign up in one of three different categories: beginner, advanced, and group. You’ll have two chances to win! There will be a Judge’s Choice—where judges will debate and pick. There will also be the People’s Choice where contestants will have their photo placed on the Rogers Public Library Facebook page and the ones with the most likes and comments will win. The Cosplay contest goes from 10 am – 3 pm. Drop in, sign up, and then explore the rest of the library to see what we have for our Fall Fest. The winners of the cosplay contest will be announced through Facebook after the votes are tallied. This event is for all ages, and you can drop in any time. You can even leave and come back as the day goes on. We will be posting some of our vendors on social media during the month of October, so you can get excited about who all is going to be here!